Young mothers of their first child often wonder: what should be the baby chair? When born a second child, experience is enough to assess normal if the newborn Kal. But with the first baby everything is much more complicated. Diapers young mother begins to change the baby in the hospital. Of course, there she first confronts him with a chair. The first will be a very unusual form and color. It's called meconium. It is the original cal. It has a greenish tint, very sticky and hard to wash off from the skin of the newborn. So be sure in the hospital you need to take wet wipes. Not always meconium departs once. More often it happens that the baby will poop several times in a row. Gradually with the arrival of mom's milk the baby's stool will change. As soon as the baby starts to eat mother's milk, his stool is more liquid than meconium. The normal color should be yellow, orange or mustard color. If the baby dirties the diaper herbs, you should consult a pediatrician, this may indicate infection in the intestine of the child. There should be no sharp smell from the feces of a newborn. Usually it smells like sour milk. The baby chair has a mushy consistency. It is not absorbed completely into the diaper. 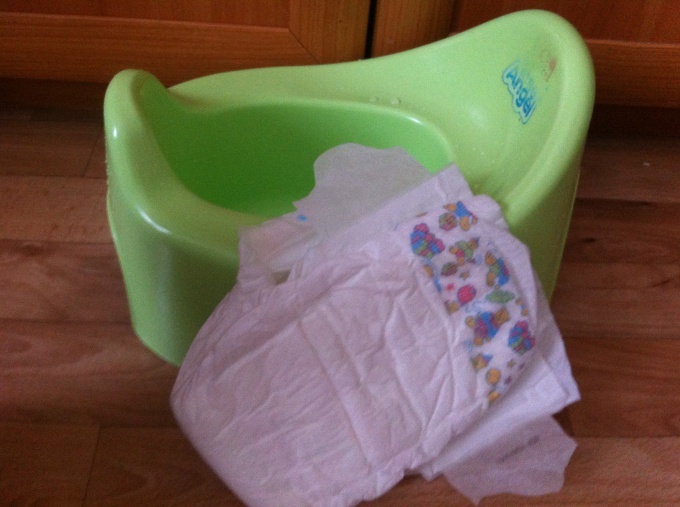 When the mother notices that the stool is liquid, and the diaper absorbs it completely, it is better to look at the child. Perhaps its just podlasia with some products in her diet. And maybe, begins diarrhea. The infant feeding formula, the stool is a little different from the babies to the milk mom. Cal baby must be homogeneous. The presence of flakes undigested curds can be an alarming symptom. Because it means that the baby does not assimilate fully everything that eats. When he did not bother, it behaves cheerfully, and the chair moves easily and painlessly, then the reasons for panic. But if in addition to the flakes in the stool mom says worry baby because of his tummy, then a trip to the pediatrician is required. It may be that the baby lacks the enzymes to digest milk. In this case, either prescribe medicines to ease digestion, or will prescribe you a special mixture. Often this lack of enzymes is accompanied by skin problems that cannot be cured with the help of Allergy meds. As soon as the baby's digestion will return to normal, the skin clears itself. In the period of introduction of complementary foods to the baby's stool is changing very much. The whole digestive system starts to work differently. To rebuild takes time. Therefore, from the beginning of the feeding chair toddler is a little different in colour and consistency from what is introduced into its diet. The feeling that purees that I feed the baby, goes almost unchanged. This is normal. Gradually, the stool will become more familiar to adults: more dark, dense. If cal leaves tight and lumpy, starts constipation. In such a situation it is necessary to increase the amount of water in the diet of the baby and be sure to add in a vegetable puree a teaspoon of olive oil. After the introduction of complementary feeding chair baby starts to smell more sharply. The child's digestion – labile system is subject to many factors. Cal all the time will not be the same. A young mother is always to evaluate not only him, but the General condition of your baby. Single liquid green stool is not diarrhea. When in doubt, mom will help a good pediatrician. You can save the diaper and show him to eliminate all doubts and anxiety for the health of the baby.